Happy Saturday, and welcome to The Doodle Garden's very first challenge - Anything Goes! I'm so excited to be part of this awesome team, and design with Jennifer's adorable images! 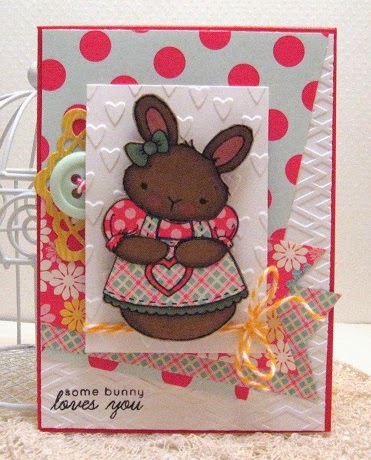 :) The image I used for this card is Betsy Bubble Bunny - which can be found in shop and ready for instant download! ♥ While we would L♥VE to see a Doodle Garden Digital Stamp being used as the focal point of each submission, it is not a requirement to participate. ♥ Your creations should be NEW creations made for the specific challenge(s), and you MAY submit your Doodle Garden challenge piece to other challenges outside of The Doodle Garden. Cathy, I can't tell you how blessed we are to have you as one of the official 'Gardeners' for The Doodle Garden! Thank you SOOO much for sharing your gorgeous creations and talent with us all! So so sweet. Your bunny is such a cutie and your coloring is fabulous. Love the choice of papers too. Gorgeous card!